Katie Stelmanis has launched her new project as Austra, and joining her are close-friends Dorian Wolf (ex-Spiral Beach) and Maya Postepski (Trust). Their debut Feel It Break - a cross between classical and electronic - hits stores on May 19. The haunting, operatic and bass-heavy record forms a nebulous escape for listeners, and a stylish soundtrack that intends to make bodies move. Before the release of her new record and her upcoming show at Lee's Palace, Stelmanis took the time to shine some light on Feel It Break. Other than being your middle name, does "Austra" mean anything in Latvian? Apparently, it means "Goddess of light". Were Maya Postepski and Dorian Wolf easy choices to be part of Austra? Are there others who perform with you live? I've been playing with Maya since my days in Galaxy six years ago. She started touring with me when I went solo back in 2008, and we've been playing together ever since. She is a phenomenal drummer and we are lucky to have her in the band. Maya and I started working with Dorian just over a year ago. We met him through friends, and knew instantly he was a great fit. In a live setting we have recently recruited Ryan Wonsiak on keys, a classically trained musician from Saskatchewan, and Romy and Sari Lightman of Tasseomancy on backing vocals. The tracklist for Feel It Break sound like characters or chapters in a novel. How do you come up with titles and what do they mean within the context of the album? Usually, all my titles are just working titles that I label a recording session, and quite often I'll just get attached and they will stick. They are often a description of what I think the music sounds like in its early stages, or simple words that I've blurted out when making demos. Are listeners in Canada a challenge in the sense that they might not understand your music? I don't think listeners in Canada are a challenge, but I think that because Canada's population is so small it's difficult to support a wide variety of musical genres. There isn't really a huge community of people making electronic music here and so there isn't a space for artists to grow. Not to say Canada isn't ready for it, I think it's just that the infrastructure of the music industry isn't quite ready for it yet. How would you describe Austra to first-time listeners? And how would you describe your music being translated in a live setting? I would call it electronic synth-based music, heavy on the vocals. In a live setting we have spent years trying to translate our pre-recorded midi tracks on the stage, and only recently do I really feel confident we are on the right track. Currently, we have a good balance of live instruments and backing tracks, so we are able to maintain the original electronic elements of the album while still creating a dynamic live performance. How do you feel about the video for "Beat and the Pulse" being censored? Does it feel like it has taken away a part of the song's power and story? I think it's silly that is has been censored, mostly because there is so much hateful crap on YouTube that people deem as acceptable. I don't know why women's sexuality is still regarded as something inappropriate, it's disappointing and does not pose a positive reflection of North American society. How has your classical training and background in choir influenced your style? My background in choir has definitely influenced my style. Harmonizing and creating multiple vocal layers comes very natural to me, and I think I can attribute that to all the years I spent in the CCOC (Canadian Children's Opera Chorus). A lot of people tend to forget that the voice is a massively versatile instrument and that you can create very interesting landscapes with vocals alone. What effect or aesthetic do you think your songs have? I think all the songs have a different effect and aesthetic. If they didn't that would be pretty boring. Generally, if my songs make any sort of effect I think that's a good thing. I would like for people to enjoy my music in a very cerebral way, and also on the dance floor in a very physical way. Basically any kind of emotional response is what I achieve to attain from a listener. 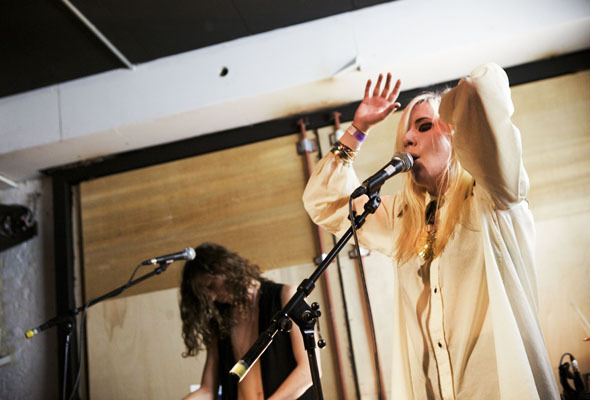 Catch Austra, along with electronic duo Trust on May 19th at Lee's Palace. Tickets are $10.50. You can pre-order Feel It Break on Paper Bag Records, which comes bundled with a free poster and Lose It 7-inch. You can also read a review of the album here and grab a free download of "Lose It" courtesy of Austra's Twitter.